Should The New York Giants Retain LB Alec Ogletree After The 2018 Season? 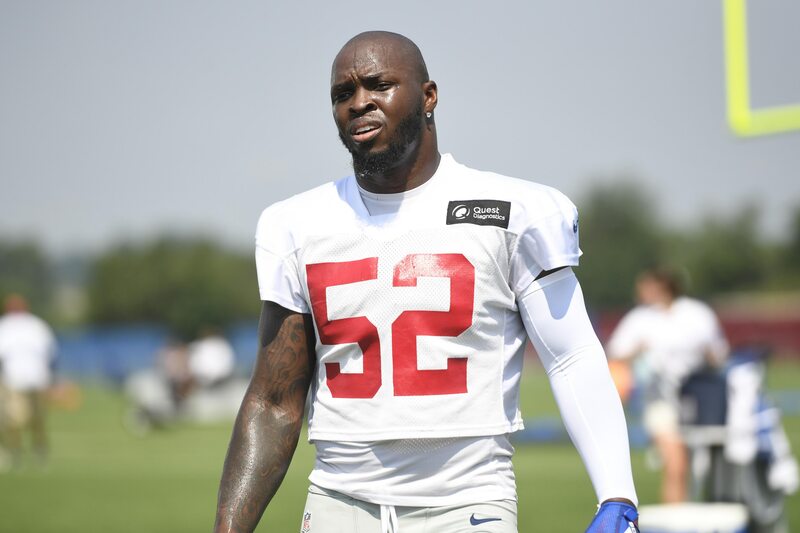 Home New York Giants Should The New York Giants Retain LB Alec Ogletree After The 2018 Season? The New York Giants acquired Alec Ogletree from the Los Angeles Rams in exchange for 4th and 7th round picks in the 2019 NFL Draft during the offseason. The Giants had a large void to fill at the inside linebacker position and the Rams were shopping Ogletree who is still in the prime years of his career at 27 years old. The Rams signed Alec to a 4-year, $42M extension and then traded him to the Giants 5 months later. The Giants not only gave up draft picks in the 2019 NFL Draft but agreed to take on his contract averaging over $10M per season. This was a large investment by the Giants and they arguably overpaid, but where do the Giants go from here? Alec Ogletree is paid as a top-shelf linebacker. The only two linebackers who have a larger salary per year are Luke Kuechly and Bobby Wagner. There is a huge gap in production between the Giants’ MIC defender and those two linebackers. The Giants still have $18M in total guaranteed money to pay Ogletree over the next 3 seasons. If they decide to release him, they would have a significant amount of dead money against the salary cap. Alec Ogletree has always been known to make big plays since his days as a Georgia Bulldog. While he’s the type of player who makes big plays, he gives up big plays as well. In 2018 he’s continued to struggle with inconsistency and in coverage, but he hasn’t played poorly overall. He has 78 combined tackles, 4 tackles for loss, 1 sack, 4 quarterback hits, 6 pass deflections, and 4 interceptions through 12 games. His play has also picked up recently, in the last 5 games he has 34 combined tackles, 1 sack, 3 quarterback hits, and 3 interceptions. One of his interceptions came in the team’s only win before their bye-week against the Texans in week 3. Ogletree’s play might be up and down, but his consistency comes off the field as a leader. He’s always seen trying to lift the team’s spirits throughout games and always has the right things to say publicly. This makes him valuable to the team in an intangible way as well. The Giants might be overpaying the linebacker based on market value, but they would be in a far worse position next year if they released Ogletree without any reliable depth behind him. If the team could successfully negotiate a pay-cut that would be ideal. If not they are better off keeping a solid player for a few extra million per year. Thats great and all but i it going to help us win. Being a leader is a great trait to have but we also need consistent production on the field. Thats why the Giants as an organization have never been consistently successful. We dont look at the right things when building a football team. We worry about feelings and personality wayyy to much.